Soft baked cereal bar with a blueberry filling. 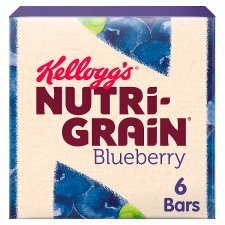 Kellogg's Nutri-Grain Bars are a delicious mix of your favourite breakfast ingredients all wrapped up in a satisfying bar. A tasty option that will kick start your day keeping you fuelled for the morning ahead*.